One of five craters on Mercury that needs a name as part of a contest by NASA's MESSENGER mission outreach team and the International Astronomical Union. 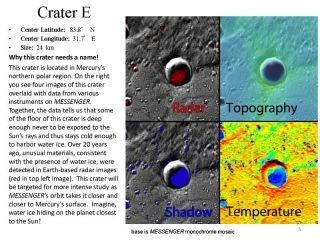 A NASA team has invited the public to name five impact craters on the surface of Mercury, but you'll have to win a contest to nab the otherworldly naming rights. The contest, launched by the outreach arm of NASA's MESSENGER mission to Mercury, calls for entrants to submit the name of an artist, writer or composer who was famous for more than 50 years and has been dead for at least three years. The rules were set up by the International Astronomical Union (IAU), the group that oversees the nomenclature of solar system features. Beethoven and Hemingway are two of the 372 Mercury craters that already have names. The contest, which launched Monday (Dec. 15) and runs through Jan. 15, is open to the public, and you can enter a name on the contest website here. NASA's MESSENGER spacecraft is the first ever to orbit the planet Mercury. See how the MESSENGER mission to Mercury works in this Space.com infographic. According to the contest rules, participants must provide a brief summary of the artist, writer or composer they are advocating, and the source of the biographical information. None of the suggested names can have any political, religious or military significance. Any names that have already been picked for other solar system features are also ineligible. For example, Ansel Adams wouldn't quality, since a feature on the moon is already named "Adams." The IAU is "particularly interested in submissions that honor people from nations and cultural groups that are underrepresented against the currently named craters," the contest website states. Anyone wishing to submit a name can check if it's already taken by using the IAU's complete list of solar system feature names. The IAU will announce the five winning names in March or April as the MESSENGER mission comes to a close. NASA's MESSENGER spacecraft has been circling Mercury since March 2011. The mission (its name is short for Mercury Surface, Space Environment, Geochemistry and Ranging) has lasted much longer and returned much more data than NASA officials expected. The probe launched in 2004 and traveled almost 8 billion miles (nearly 13 billion kilometers) to reach Mercury. MESSENGER was supposed to capture only 2,500 images of its target planet but has returned more than 250,000 snapshots. However, next spring, the spacecraft will finally run out of fuel, succumb to the planet's gravitational pull and crash-land on its surface. The mission has radically changed astronomers' understanding of Mercury. The spacecraft revealed that Mercury likely harbors ice wateraround its north and south poles — two areas of the planet that are constantly shaded from the sun. Follow Kelly Dickerson on Twitter. Follow us @Spacedotcom, Facebook or Google+. Originally published on Space.com.